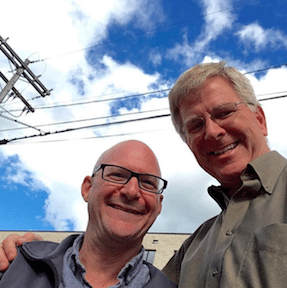 My first of two radio interviews on the program, “Travel with Rick Steves,” aired this weekend. You can listen to it with the audio player below. It was a fun, fast-paced interview, and there were a few things I didn’t get around to saying. If you scroll past the audio player, you’ll find my “liner notes” from the interview — more Vietnam travel tips and elaborations on things I said. 13:30 – Rick opens the segment with: “Ten years ago, a lot of Americans still wondered if it was safe to travel to Vietnam.” I mention that I felt nervous the first time I came here. On our first trip to Vietnam in 2008, I wondered how I’d be received as an American, and, as I mention in the interview, I have never experienced any animosity, in spite of our two countries’ turbulent history. What has been interesting to me is that when I first started visiting Vietnam, between 2008 and 2010, people in the United States often asked me if it was safe to travel here – and their question was not about general travel safety. They were asking specifically because of the war. As time has passed, I hear this question a lot less now. It’s nice to know Americans have finally gotten the memo: We are welcome here. 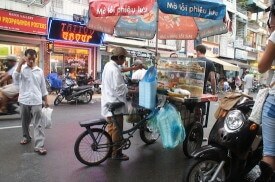 A bicycle street food vendor on Bui Vien Street in Ho Chi Minh City. 15:30 – Rick asks: “The country still is communist, technically. What does that mean? Because When I think communist, I think Red Square in Moscow, but when I think traveling in Vietnam, to me it seems like a capitalist free-for-all on the streets. Yes. I live in a neighborhood with lots of labyrinthine alleyways where you really see Vietnamese capitalism in action. People run little businesses out of their homes – small cafés, street-food stalls, convenience stores, miniature produce markets, etc. Rick brings up Cold-War-style communism in the Soviet Union. The stereotypical image many Westerners have from that era – of goose-stepping soldiers, non-descript apartment blocks, people with dour faces dressed in bland-colored clothing – is not at all what you’ll find in Vietnam today. You will see hammer-and-sickle flags in the streets, and government posters designed to instill certain social and political values. Other than that, as a casual visitor, you will not feel any of the bleakness that pervades the typical Western stereotype of Cold-War communism. 16:00 – I explain: “There are times when things on the Internet get blocked, such as Facebook and Twitter and the BBC. When I started visiting Vietnam, Facebook was routinely blocked, though people found ways around that. Today, most of the time, Facebook is readily accessible. Twitter and the BBC’s website are blocked more often. What is strange to me is that CNN.com is not. On television, we get both the BBC and CNN; however, many cable companies show them on a ten-minute delay. They are occasionally censored. One thing you do need to be careful with is your phone. Pickpockets and thieves are more interested in your phone than they are in your wallet. An iPhone can be worth several months’ wages to some people. You should never set your phone on a table at one of the many streetside cafés. It can disappear quickly. If you need to look something up on your phone, also be mindful of where you take it out. Professional thieves are experts at snatching them while riding by on their motorbikes. If I need to use my phone on a crowded street, I step away from traffic – and still keep my eye on who might be coming on the sidewalk. Follow these rules but then relax. You don’t need to be paranoid! Just be aware of your surroundings. Another common scam one encounters here is: Someone will approach you with a story intended to reel you into a conversation. This happened to me once; a man asked where I was from, told me his daughter was going to move to Seattle to work at a hospital there, and invited me to have coffee with him so he could learn more about my city. I could tell, by the fact that he eyed me from far down the street, and walked up to me with this highly “coincidental” story, that something wasn’t right. What I’ve read happens next is an elaborate series of events. You have coffee. Then you’re invited to meet some of the man’s friends. You play a friendly game of cards and maybe have a beer or several. They entice you into making a small bet. You win a few times. Your confidence soaring, you eventually agree to a large bet. You lose (because they know how to cheat). If you don’t have enough cash on hand, they insist you go to an ATM, and will become aggressive if you try to avoid paying. This is a story I have read about. I’ve only been approached in this manner once. Again, don’t be paranoid. Just don’t gamble with strangers. Trust your instincts. Most people in Vietnam are friendly and honest, but if someone seems a little too friendly too quickly, or if they seem to have an elaborate program of activities in their head and you have just met, walk away. That said, many people here sincerely just want to chat and practice their English. Getting to know people in this sort of situation – at an outdoor café or streetside watering hole – can be tons of fun. So don’t be afraid to talk to strangers, but do it in places with other people around. and be careful what you agree to participate in. A private guide can lead you on adventures you wouldn’t have on your own. 18:50 – I talk about hiring a local guide to experience everyday life. If you are looking for a guide in Saigon or the Mekong Delta, I highly recommend my good friend, Trần Phúc. Phúc (Family names come first in Vietnamese, so his “first name” is Phúc. And I know what you’re thinking; his name rhymes with “book,” not “buck”) guided Kattina and me on our first trip to Vietnam and we have become good friends. Phúc comes from a small village in the Mekong Delta and has lived in Saigon for many years. He speaks very good English and does a great job of introducing travelers to authentic, non-touristy experiences – both urban and rural. If you are interested in hiring him, you can learn more about Phúc here. 19:40 – Elizabeth calls in to talk about about her trip to Sapa, in the north. Unlike many foreign companies that operate in Sapa, Sapa O’Chau pours its profits back into the local community. They run a boarding school that serves to train local guides in both guiding and language skills. They employ indigenous tour guides, particularly women who would not have other work opportunities, in an area where jobs are scarce. Our Sapa tour guide, Mo, hangs out in the rice paddies with my trusty travel mascot, Sven Wondermoose. 21:20 – We talk about hiring private drivers. What I recommend for two or more people traveling together is booking both a local guide and a private driver. Two people should budget around $180 per day ($90 each) for this. If traveling solo, you can sometimes find local guides who will drive you on their motorbikes. (Traveling partners could book two motorbikes for this.) Again, in southern Vietnam, my tour-guide pal, Phúc, can help with this. On a side note, Phúc and I can also work together to offer small-group travel writing workshops in Saigon and the Mekong. We’ll travel together and I’ll teach you about travel writing as we go. Drop me an e-mail if you’re interested. The Beach Bar Hostel in Hue offers private, thatched-roof bungalows for $30 a night. 22:40 – Rick asks: “How would you shape, just in general terms, a two week vacation in Vietnam? This was something I could have talked about for a lot longer, had there been time. I mentioned starting in either Ho Chi Minh City or Hanoi – mainly because they have major international airports. Danang, in central Vietnam, also has connecting flights to several major Asian flight hubs. In central Vietnam, places I recommend visiting are Danang, Hue, and Hoi An. Of the three, Hoi An is my absolute favorite. You can fly into Danang, then catch a taxi one hour south to Hoi An. Between Danang and Hue (pronounced “hoo-AY,”), you can catch one of Asia’s most scenic train rides over the Hai Van pass. If you can’t get a seat on the scenic side of the train, try going to the dining car and ordering a drink. In Vietnam’s Central Highlands, Dalat is a delightful town with some great hiking. It’s another good spot to learn about some of Vietnam’s ethnic minority groups. 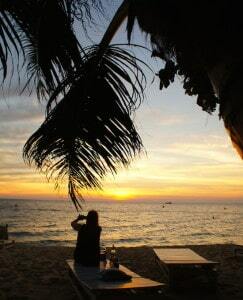 Phu Quoc: If the first beach you find is crowded or polluted, head to the other side of the island. Danang and Hue have nice beach areas. Other beach towns to consider are Phu Quoc Island, Mui Ne, and Nha Trang. Mui Ne tends to be windy. It’s Vietnam’s unofficial kite-surfing capital. Unfortunately, both Mui Ne and Nha Trang have become overdeveloped. Some of the beaches have become quite poluted. For that reason, I’m not a big fan of Nha Trang. If you do go there, catch a taxi 30 minutes south for cleaner, less crowded beaches than the ones you’ll find downtown. 23:40 – Rick and I discuss visiting Halong Bay and Bai Tu Long Bay. If you splurge anywhere, I recommend doing it here. 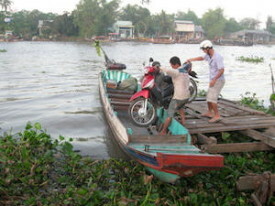 Lots of tour companies offer one- and two-night cruises – some on traditional Vietnamese junk boats. (That’s “junk” as in the style of ship, not junky boats!) Most of these ships are small with anywhere from five to twenty cabins. Many offer kayaks and visits to local floating villages, caves, etc. Sadly, some areas of Halong Bay have become overcrowded and poluted, which is why I recommend finding a company that will take you to nearby Bai Tu Long Bay. For my travel writing tour, we will be partnering with Indochina Junk. A couple of years ago, I also had an excellent experience on a cruise organized by Handspan. I mentioned my top suggestions for Ho Chi Minh City: The War Remnants Museum and a day-trip to the Cu Chi Tunnels. What I didn’t get to was Hanoi, where you can visit Hoa Lo Prison. Originally used by the French to contain political prisoners who opposed colonial rule, the prison was later taken over by the Viet Cong. Many American POWs were imprisoned there, including US Senator John McCain. Another place well worth a visit is the island of Côn Sơn in the Côn Đảo Archipelago. A 45-minute flight from Ho Chi Minh City, the island has twelve former political prisons used during the war to contain and torture Viet Cong prisoners. The prisons are stomach-churning when you learn of the conditions. At the same time, the island has some of Vietnam’s most pristine beaches. You can read my three-part series about the island here. I am also working on a video documentary with Saigon-based filmmaker Jeff Nesmith. You can watch our preliminary video about Côn Sơn Island here. The book I am writing, The Ghosts of Bùi Viện Street, is about the local residents who live in Saigon’s so-called “backpacker ghetto,” the street vendors who work there, etc. (There is also an allegedly haunted bar.) I hope to have my rough draft finished by the end of 2016. If you’d like to know when it’s available, you can sign up for my e-mail newsletter near the top right corner of this page, or follow the Globejotting Facebook page. Regarding hotels, the place I always stayed, before I lived in Vietnam, is called the An An 2. Their sister hotel, the An An 1, is a little bit more upscale and a bit more expensive. The staff is extremely friendly and always made me feel like family when I visited. Saigon is a noisy city, but if you’re looking for a little less crazy neighborhood, consider staying near Dong Khoi Street or behind Ben Thanh Market. 27:10 – We talk about homestays. My two favorite homestay experiences have been at the Ba Duc Ancient House in the Mekong Delta town of Cai Be, and a very rural farmhouse near Sapa, which I booked through Sapa O’Chau. 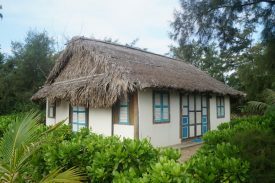 Ba Duc has guesthouse-style rooms that are very basic, but clean and air-conditioned. They also serve great meals in their delightful, fruit-tree garden. My homestay experience with Sapa O’Chau was amazing, but be aware, they had some of the most Spartan accommodations I have stayed in, including a shared, outhouse-style bathroom. 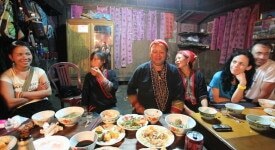 Dinner at a homestay near Sapa after a long day of trekking. Keep in mind, if you sleep at a homestay in Sapa, you will be experiencing true life in a poor area of the country. It was absolutely worth it for the cultural experience,– not to mention some of Vietnam’s most mind-blowing scenery. Dinner was served around a long, communal table. We ate with other travelers, our guide, the family who runs the guesthouse, and some of their neighbors. We ate, talked, and slurped Vietnamese sticky-rice wine late into the evening. The wood-fired, herbal hot tub was also a fun experience. I can’t stress this enough. Particularly in rural areas, try to find local companies, such as Sapa O’Chau, who give their profits back to the community, and who train and employ guides from the immediate area. Many international companies have set up shop in rural but touristed parts of Vietnam. They take advantage of the natural beauty, and while some of these companies do employ local people, a lot of their profits land outside the local community. People in rural areas need tourism income to survive. I encourage you to support them. Absolutely! Some people like group tours. Others are hard-core independent travelers. But as an independent traveler in Vietnam, hiring a private guide can take you deeper into the culture than you’d manage if you ventured on your own. If you’d like to stay informed about my latest publications, writing and travel workshops, tours, and more, you can subscribe to my free newsletter. Just type your e-mail address in the upper right-hand corner of this page. (You can unsubscribe at any time!) You can also follow Globejotting on Facebook, Twitter, and Instagram. Got questions? Feel free to drop me a line! I’m happy to answer short questions via e-mail. If you’d like to hire me for a more detailed Southeast Asia trip-planning session, I offer travel consulting via Skype, phone, and Facetime. You can read more about why Kattina and I moved to Vietnam in this article: Living On Vietnam Time. Rick is a great entrepreneur !